The circumambulatory Space-soundBody is a type of Space-soundInstallation the individual exhibits of which have a three dimensional sculptural structure of loudspeakers which can radiate sound in different directions and which is specifically developed for the particular architectural space. The distribution of the sound sources in the space is arranged in such a way that both a horizontal and a vertical linear loudspeaker body are formed, around which one can walk and through which the individual sound strata sound with specifically developed types of movements. The dimensions, and measurements of the individual loudspeaker-body depend on the size of the performance space. As required, an object is developed for the loudspeaker ensemble on which the loudspeakers are installed, as shown in figures 3 and 4. As the loudspeakers can radiate in different directions and the loudspeaker ensemble is free-standing in the space, the visitor can – by contrast with the Space-soundObject – perceive the sound from different directions, the term ‘circumambulatory’ primarily refers to the three-dimensional reception mode of the variable listening perspectives, which are of equal quality throughout the entire space. The two examples illustrated here from the project series ‘Sonic Lines n’Rooms’ represent an 8-limbed ‘diagonal-horizontal’ (Fig. 3) as well as an 8-limbed ‘diagonal-vertical’ (Fig. 4), circumambulatory Space-soundBody. 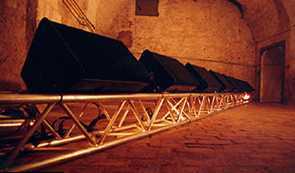 The loudspeakers are installed on steel crossbeams – each approximately 10 metres long – running across the space. The figures show two of the four rooms of the vaulted cellars of the Fürstlich Fürstenbergischen Hofbibliothek, for which the artist-couple created a four-part Space-soundInstallation, as a commissioned piece for the Donaueschinger Musiktage 1999.